At 2PM today, the official temperature here is only -21°C. Of course the sliding door latch on our 2009 Dodge Grand Caravan would freeze today. Thankfully, it’s not the locking mechanism (or we’d spend the rest of the day emptying the van of it’s contents so no one else would over night!) but just the front latch. 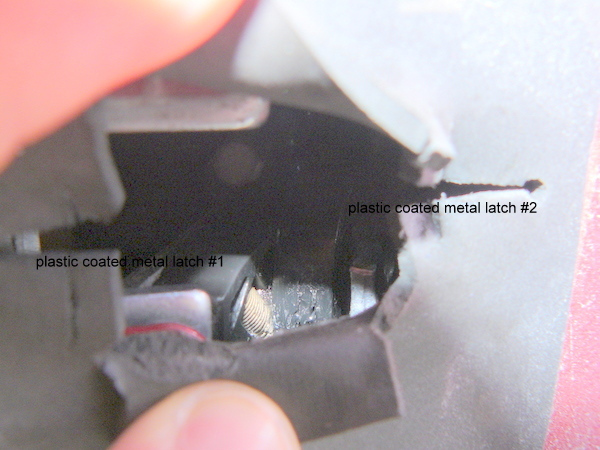 As you can see in the image below, the front latching mechanism is covered by a wonderfully flimsy piece of soft rubber. In theory this flap should be able to keep large debris out but unfortunately, it also appears to allow water to collect and pool in the mechanism. I’m not entirely sure why we had water in the door but when I opened it today, I could see large amounts of ice lodged in between the two latch parts (shown in the picture below) as well as between the latches and the bottom of the opening. After I poked at the ice and removed a fair bit, you can see that the first latch appears to be back in the right position. The second latch is still rotated in an locked, or partially locked, position. This prevents the sliding door from closing completely. Unfortunately, as you can see, the plastic coating on the second latch took a beating the first couple times we attempted to close the door. Ooops! 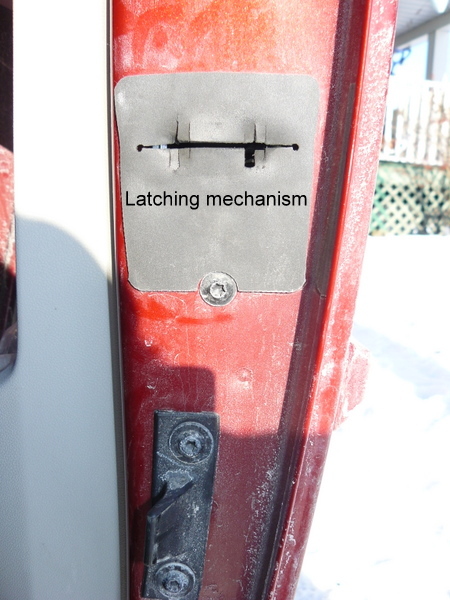 By the time I took the picture above after removing the ice, the second latch has started to rotate downwards into what I assume should be a similar position as the first latch. I’m going to dig out a heat gun and try and melt the remaining ice in there in hopes it will allow everything to return to the correct position. Then I get to cross my fingers and hope it doesn’t refreeze overnight when our forecast low is -30°C. Updated: Well, a few minutes with the heat gun and voila! The second latch rotated down into place and now the door closes fine. I’m still not overly thrilled with this design though as it’s pretty obvious the problem stems from water/ice being able to collect in the bottom of the latch mechanism. Oh well, something to watch for over the next few months and years. 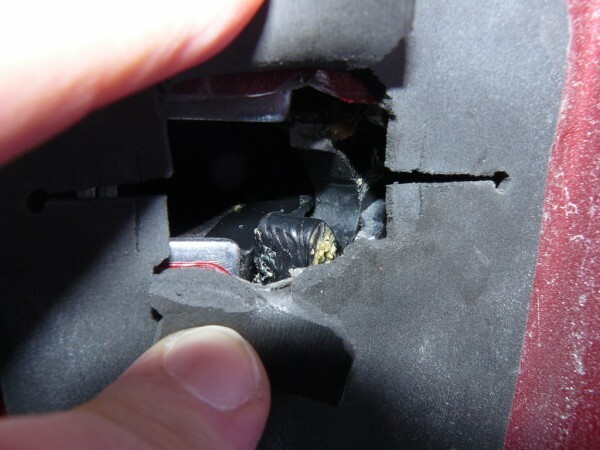 This entry was posted in Automotive and tagged Dodge, door, frozen, Grand Caravan, Ontario on 2011/01/23 by Jeff Ivany.